It gives us great pleasure to announce that the Royal Cork Yacht Club has retained the TYHA 5 Gold Anchor Marina award as well as an ICOMIA (International Council of Marine Industry Associations) Clean Marina Award. The Royal Cork became the first Yacht Club in Ireland to be awarded this prestigious title in 2011 and further to a recent inspection, the Club has again retained this status. Ratings range from one to five gold anchors and for the Royal Cork to attain the maximum number of anchors again is a fantastic achievement by all of the Club staff involved. 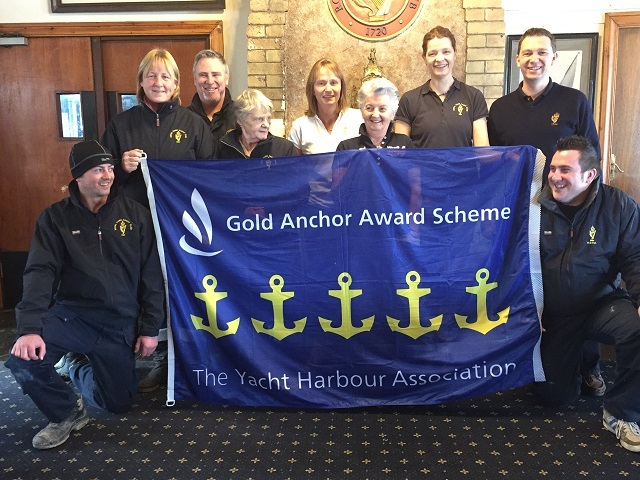 The Gold Anchor award scheme is a voluntary assessment programme focused on customer service and providing Quality Assured Berthing for any boat owner. The scheme is designed for the marina consumer by The Yacht Harbour Association with contribution from the RYA. With 26 years’ experience of Gold Anchor standards, this is a point of reference for all boat owners to make an informed decision on where to berth. For more information about the Gold Anchor Scheme, visit The Yacht Harbour Association’s website, www.which-marina.com.